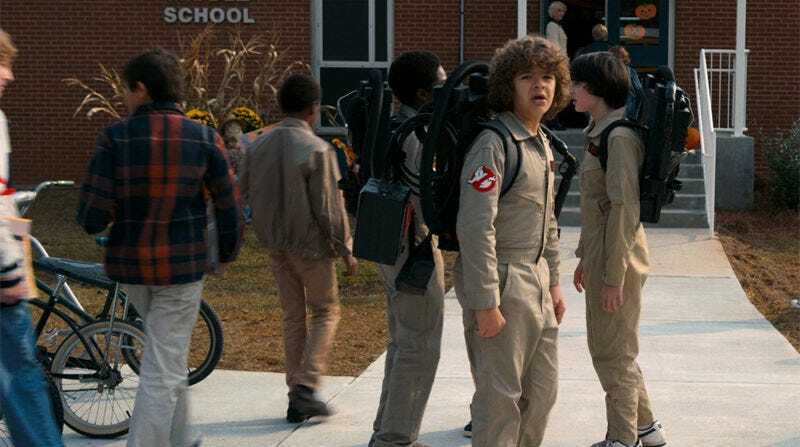 We now know what the state of Stranger Things will be when it comes back later this year. We know how long the time jump between seasons will be, what new characters are getting added, and the boys’ Halloween costumes. We know a lot, except for what’s going on with Eleven. The Byers family: Will (Noah Schnapp) is seeing visions and no one knows if they’re real (the effect of being in Upside Down for that long, presumably) or just a psychological coping mechanism. Joyce (Winona Ryder) has decided that stability comes in the form of a father figure, and is dating Bob (Sean Astin) in order to provide one. Joyce and Bob have a history—they went to school together. Newcomers Paul Reiser, Dacre Montgomery, and Sadie Sink: Reiser will play Dr. Owens, the new man in charge of the lab. Sink’s character is Max, and it sounds like Max will be in a love triangle with Lucas (Caleb McLaughlin) and Dustin. Montgomery plays her brother Billy, who co-creator Matt Duffer likened to one of Stephen King’s “really great human villains.” Given that comparison: he’s a bully. King always likes to throw in a bully. Secrets: Hopper (David Harbour) is trying to cover everything up, to keep everyone safe. I think we can also safely guess he’s not completely successful. So much damage: Co-creator Ross Duffer says the most messed up members of this highly dysfunctional group will be Nancy (Natalia Dyer) and Mike (Finn Wolfhard). They’ll be dealing with what they see as the losses of Barb and Eleven. “She and Mike are both the most screwed-up because they’re the ones who both lost someone. They’re both grappling with that, and we see the effects,” Duffer told EW. But while we know from photos and footage that Eleven (Millie Bobby Brown) will be back, there’s nary a hint about how or what she’s doing. We’re just going to have to wait until Halloween, I guess.